Epoxy grout has several advantages over cement grout. It is stain proof, the colors are consistent, the grout is crack resistant, and it is easier to clean than cement grout. Its disadvantages are that it is expensive and gives limited time to work before it sets up especially in warm weather. My brother used epoxy grout in his shower and he thought it was great stuff. I needed grout that was resistant to cracking especially for the tile on the perimeter of the slab where it is over foam insulation. I purchased 500 square ft of brown porcelain tile through a craigslist ad and I figured that the commercial size of Spectralock grout would be adequate if I used it all. These boxes contain four full sets of part A and B and four containers of the fine colored sand used in the grout mix. 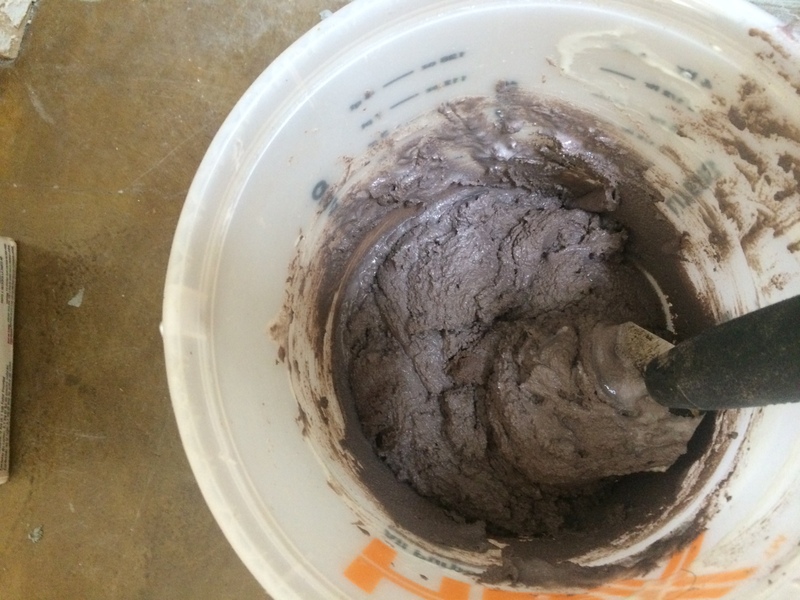 Because the epoxy grout sets up so quickly, a beginner definitely needs to mix only a small amount at one time. The Laticrete site has a spreadsheet calculator for various sized tiles and grout lines. I downloaded it and a full unit of Spectralock Pro would cover about 176 square ft of 1/8″ grout lines for 13″ x 13″ tile. 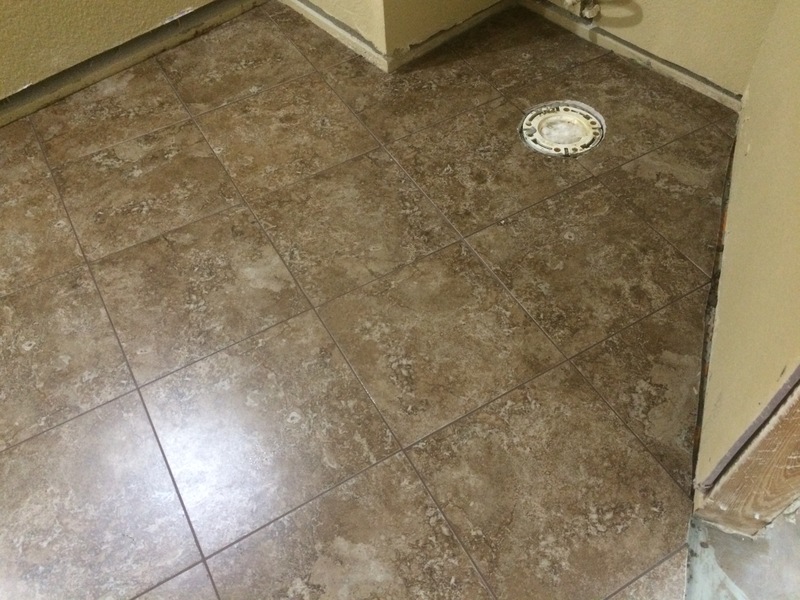 A mini unit of grout covers about 44 square ft. which is perfect for the bathroom. I found a website that explained how to split a full unit into four mini units. So that is what I did. It was important to weigh the material to ensure an exact amount of each part. I used our kitchen scale. 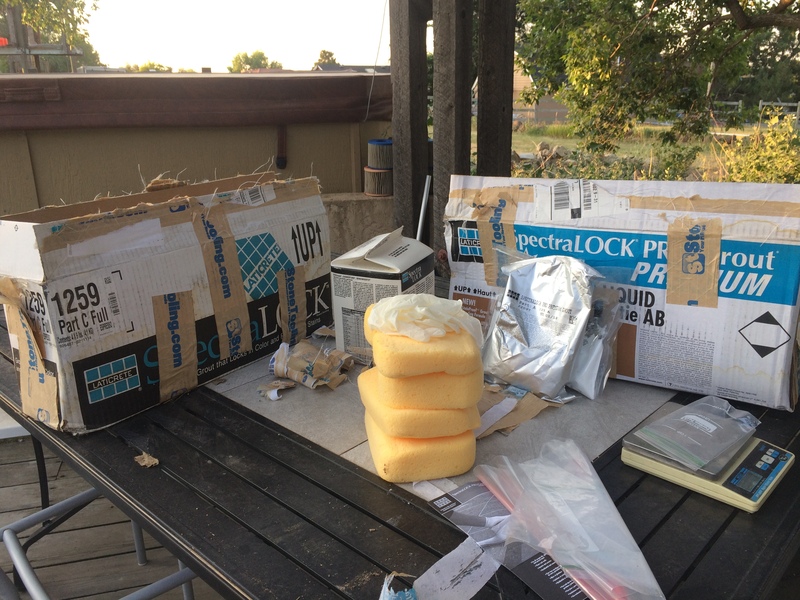 The epoxy parts are not easy to work with as they are sticky and don’t ooze out of the packets that easily, especially part B. The grout is sanded but the sand used is very fine. It is combined with the color in an exact mix so that from batch to batch the color is consistent. 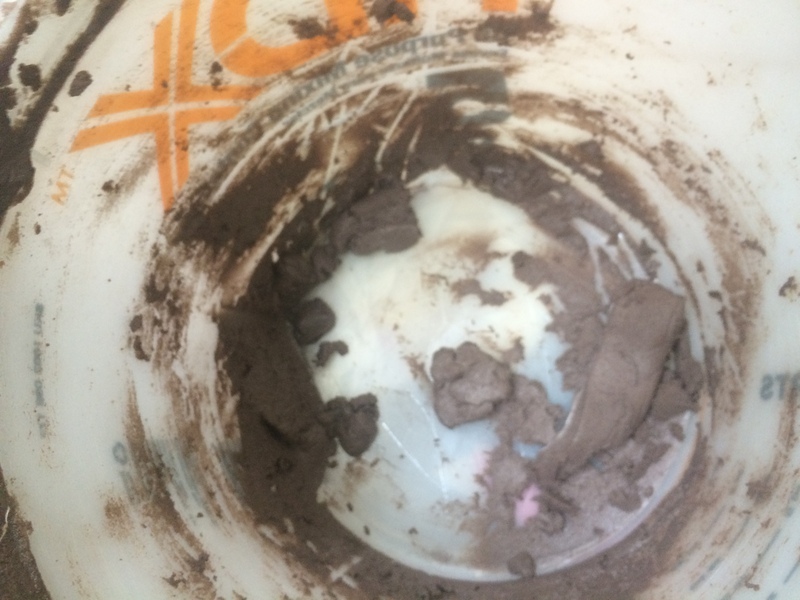 After dividing the full unit into three smaller parts to keep and one to use which I left in the original packages, I was able to mix Part A and Part B from what was left and then add Part C, the sandy part. 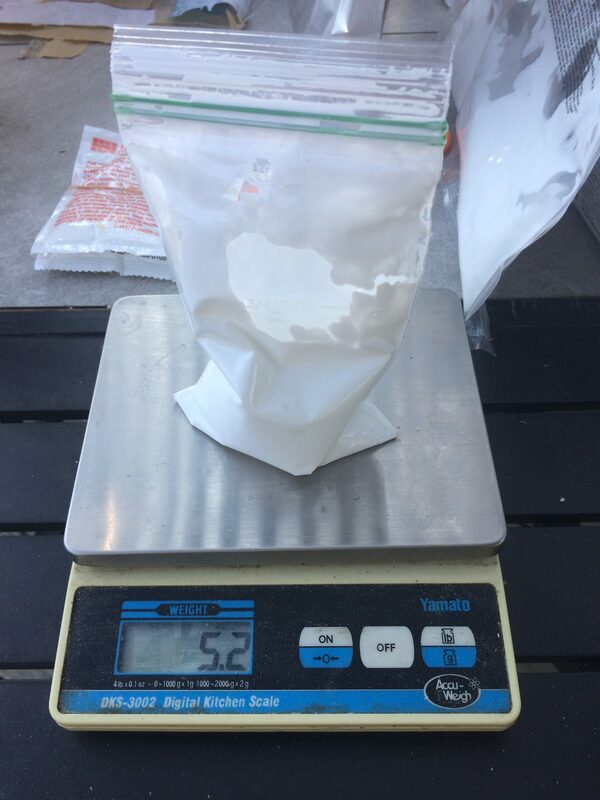 The website that I read said to mix well only about 75% of the dry sand and then add the remainder to get the final consistency. The mix seemed on the dry side so I didn’t use all the Part C. But I used most of it. The texture is supposed to be like peanut butter but mine was a little stiffer. The instructions say to dump it all out on the tile but I thought that would be difficult to move around, also it is supposed to be applied with the rubber grout float but I found I could squish it into the grout gaps easier with a trowel and then cleaned the excess off with the rubber float. After the grout lines are filled, it is a 15 minute wait to wipe off the excess. 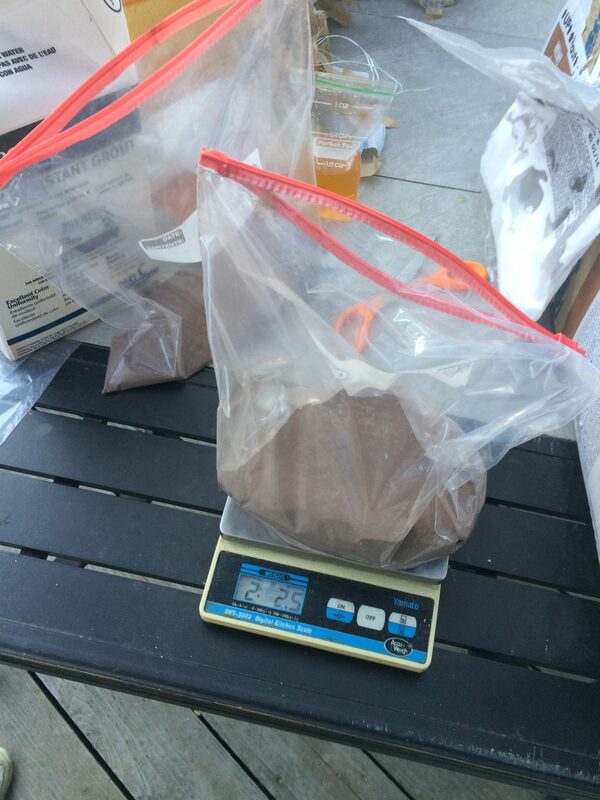 Another way to measure is from the time the process started, so the first wash should be within an hour of mixing the grout. The wait time is longer if it is colder, but these days are warm at 85-90 degrees so I waited about 10 minutes and started the first wash. I used the included cleaner for the first wash but instead of using a sponge, I used a blue microfiber pad. It was easier to rinse out often and I could feel the excess grout through the pad when I could not feel it through the sponge. During this wash the grout is still malleable and if there is a gap in the lines extra grout scraped from the tile or from the original mix can be pressed into the empty spaces. I just did this with my fingers and then wiped the grout line to make it look even. This is the grout that was left over after I finished the tile. I just discarded it. The instructions say to count on at least 10% waste and that looked about what I had left over. 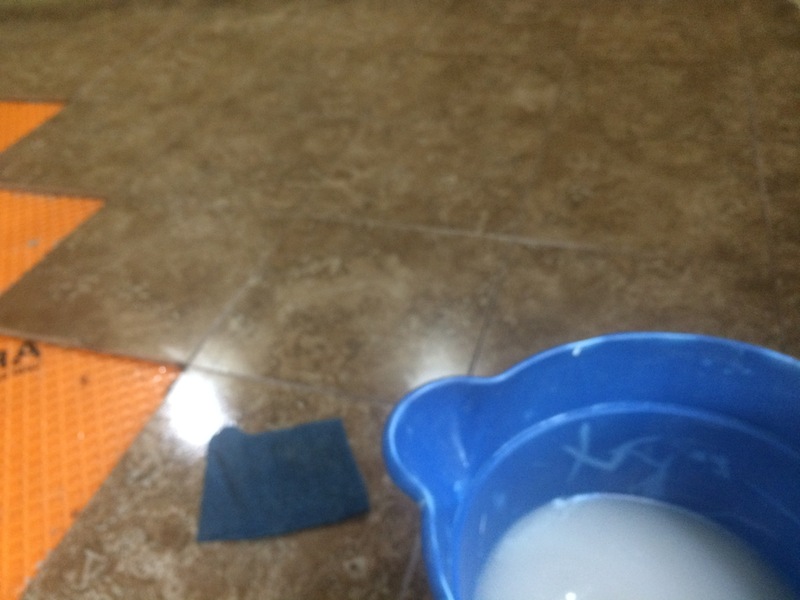 I cleaned the floor the second time with just vinegar and water and a white 3M pad which scraped off the grout that stuck to the tile followed by wiping with the microfiber pad. I had to rinse the pad often and I felt it start to get gummy before I was finished. When a sponge gets gummy they say to throw it away and use a clean one, but I was able to soak the pad in a bucket of vinegar and warm water and the gumminess rinsed away. 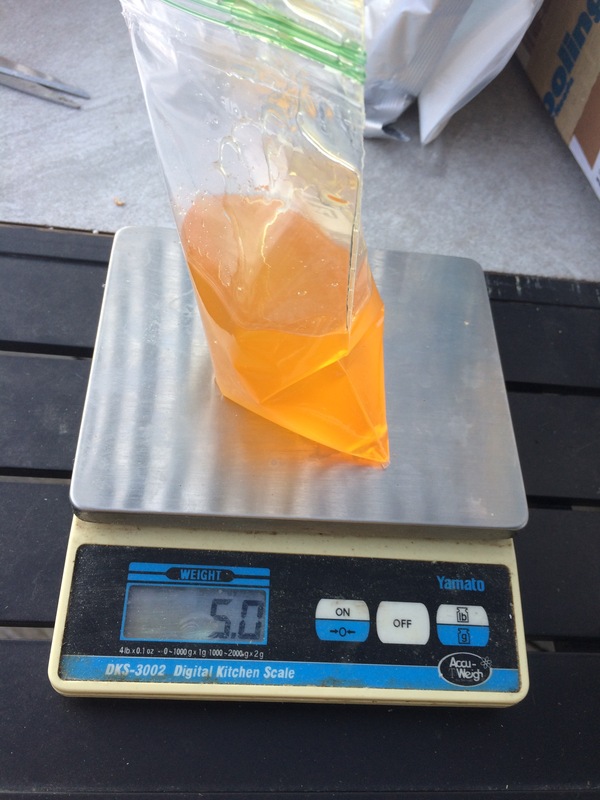 I used the sponge on the final vinegar and warm water rinse instead of the pad and the water stayed very clean, one of the ways I could tell it was finished. The floor looked great without any epoxy haze left on the tile. 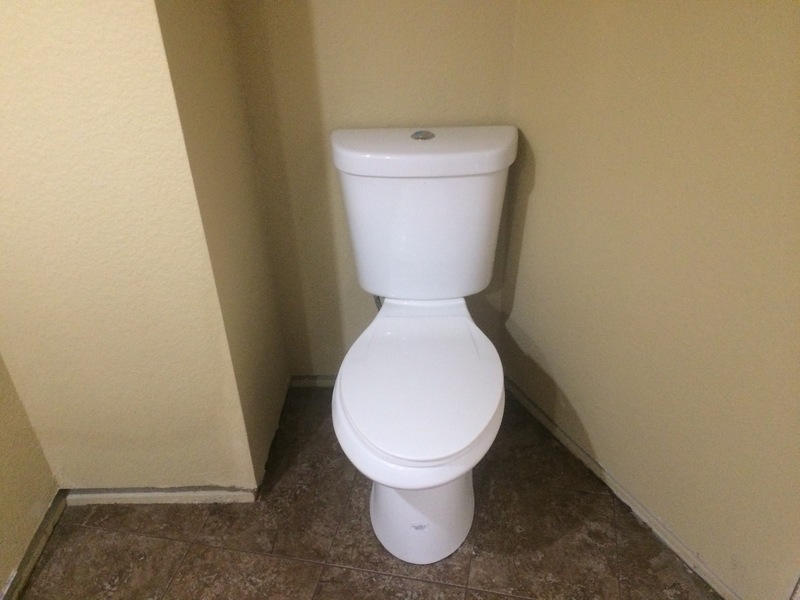 With the toilet installed again. Finally a two toilet home again. This entry was posted in Bathrooms, Tile. Bookmark the permalink.